Here's an alternative to trimming! 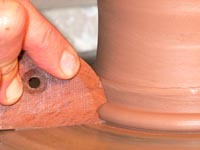 Produce an instant rounded foot profile by pushing this easy-to-use tool into the base edge of a wet pot on the wheel. You can create an interesting scalloped foot profile by rhythmically pressuring the tool into the base edge of your slowly spinning form. Using the cornered point of the tool, add some decorative lines to complete your foot treatment. Pull it along the foot of a slab-based form to securely attach the wall to the base. And, at the same time, create an even, rounded, smooth foot edge - all in one step! Each tool has two rounded foot profiles and an easy-to-grip center hole. Made of hardwood."